I’ve been running some experiments with two Logitech Quickcam for Notebooks Pro and the Raspberry Pi and unfortunately I haven’t been getting any good results. I can’t get many fps and some of the captured frames contain corrupted data but I think I may have found out the reason for that. After some reading I verified that the USB ports of the Raspberry Pi can only source 100mA to a device and maybe the cameras are consuming more than that. To bypass that problem I went out to buy a USB hub with external power supply. However, I verified that hubs with external power supply can be quite more expensive than the ones that don’t have external power supply. No big deal, “I’ll just by a cheap one and add the external power supply”, I thought. And that’s what I did! After all I just had to add a wire on VCC, another on GND and cut the VCC wire of the USB cable that connects to the computer… So, I went to a shop and bought the cheaper USB2.0 USB hub that I found and took it home for some small hacking. The hacking started with a close inspection of the device, which made me realize that maybe the small hacking was going to be even easier than I thought it would be. The USB hub has the shape of a 4-pointed star and in one of the corners there’s the USB cable. However, I noticed that on another corner of the enclosure there was just a small hole. “Weird! Why is this hole here?”, I thought. I opened the case and right next to that unexpected hole, there were three holes in the PCB without any component inserted on them. I started to guess that those holes in the PCB and the hole in the enclosure were to solder the connector for an external power supply. I used my multimeters’ sound probe to verify if my suspicion was correct and fortunately it was! 🙂 Two of the holes were on a GND trace and the another one was on the VCC trace. Locate the GND and VCC traces and solder a wire to each one of them. Solder a connector to the wires. Cut the VCC (red) wire of the USB cable that connects the hub to the computer. The USB hub also works with the Raspberry Pi. However I didn’t test the webcams with the Raspberry Pi yet. If you want you can check my previous post about my first impressions on the Raspberry Pi. And that’s it! Hope you liked this simple hack and found it useful for your own projects 🙂 Take care! Update (04/06/12): This project is also available on www.instructables.com . You can see it here. 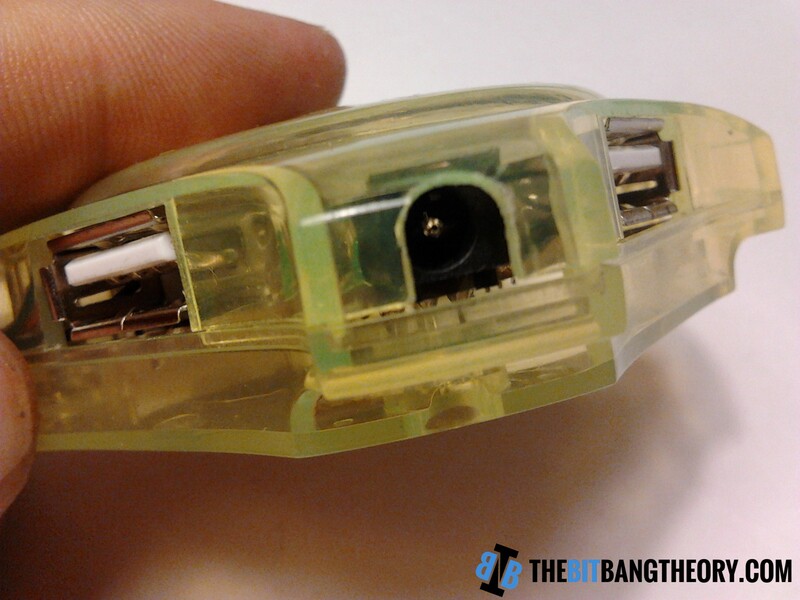 Update (25/05/13): This project has been featured on Hackaday . You can see it here. Did you populate the C4? Do I really need to cut the VCC wire of the USB cable which connects to the computer? Could I just connect directly an external power source to 1 port of the hub? Yes, you need to do it. Otherwise you will have two power supplies “fighting” to supply the hub and the devices connected to the hub. And that’s something you surely don’t want to happen because it can damage any of the power supplies :\ If you don’t want to cut it, you can also desolder the Vcc cable so that you solder it again someday later. Regarding connection an external power source to 1 port of the hub, it can be done if all ports share the same power lines. However, you still have to cut/desolder the Vcc wire that goes to the computer. You could place a diode (preferably a schottky diode, which passes more current) in each power supply line (one for the computer and one for the external supply) so the current would only flow in one direction for each supply and wouldn’t “back-feed” into the other (though I don’t think they would anyway). (Diodes are like one-way valves.) This way, you could leave the computer’s supply and the external supply connected at the same time, and the usb ports would draw current from whichever supply has got current to deliver. Hi,how can i connect a LM7805 5V IC to the empty space for the power connector? There are three holes there. Hi! You can’t just put it in the three holes that are already on the board since two of the holes belong to the same track. The only way is to put the 7805 with the input and output capacitors in a small separate board and then connect that board to the three holes with 2.54mm pin headers. Hi,Can the modified usb hub be used to charge smartphones like iPhones and Android and also mp3 players ? How is the connection for data – and data + lines made in this usb hub? I heard different smartphones have different data lines settings. Hi! Yes, you can use it to charge any USB Device. Just make sure that the power supply that you use can provide enough current for all the devices. If you just want to charge devices, The data lines are not used. If you just use the VCC and GND lines the devices will begin charging. The data lines are only used for communication, not for charging. Take care! Can i just cut the Vcc wire from the input cable and connect it to external power adapter. (i.e after cutting the red Vcc wire, i can solder Vcc from external adapter right) will it work. Hi! Yes you can do it. 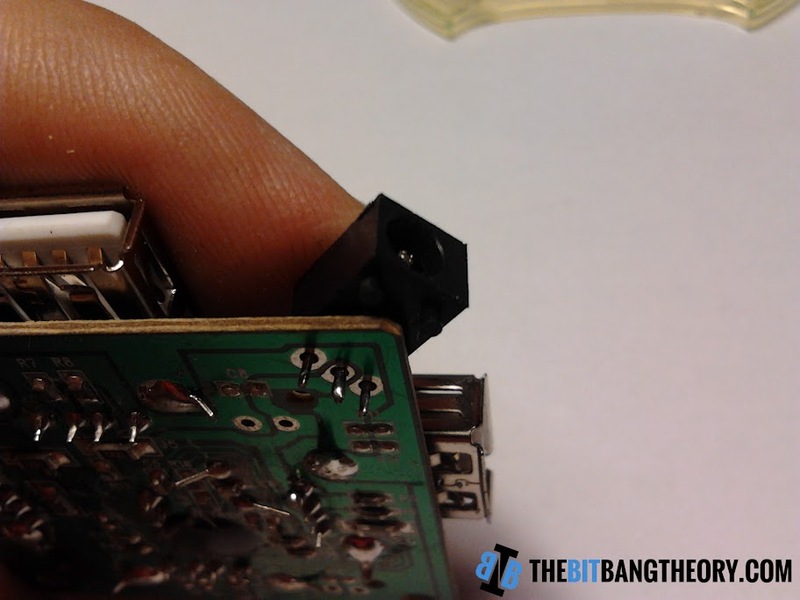 You can cut the VCC wire and connect the wire that is soldered to the board to the external power. Make sure it doesn’t touch the VCC wire from the Hub’s USB cable. Also, connect the GND wire from the external power to the GND wire of the USB cable. Do not cut this one. I hope I have explained myself well. If you still have any doubts just let me know. Oh, and make sure that the external power provides a stable 5V voltage. Thanks msaleiro, i tried and its working. many thanks again. Cool! 🙂 I’m glad it worked! Take care! Btw, did the camera worked with R-Pi? what make and model is the USB hub you used and where did you buy it if you don’t mind my asking? http://imageshack.us/content_round.php?page=done&id=4tHclKKklaKqlqiS2-Ld0evRo83b2g are those the right holes? Sir can i after cutting the red wire, directly connect the external power cables to the circuit? Very nice work! But cutting the VCC to the computer means you can’t use the hub if not externally powered, right? I bought a no-brand powered hub and I noticed that whenever it was connected, it would power the port that connects to the computer. I was going to cut VCC to the computer as you did there, but I wonder if a diode would solve this problem instead. Or use a schottky diode, which only has a voltage drop of 0.2v. Useally the type of connector you used has a build in switch, so if you plug in external power the batteries of a device are disconnected. Hence the 3 pins on the connector. Did you check with an ohm meter if the power coming over usb from a pc is disconnected by the switch if you insert a plug in the connector ? The tracks are a bit hard to make out in the pictures, so i cant really see if external power goes to the switch pin of the connector. I had been thinking about powering an unpowered hub. What concerned me was how does the hub know it was powered now. As in unpowered mode it knows it can distribute 400mA over 4 ports. But in powered mode it can distribute 2000mA over 4 ports. So it can power more power hungry devices. I was afraid there was some pin you needed to put voltage on if the hub has external power, that else it would still only allow 4 low power usb devices. Even if it has capacity for more with external power. Very nice, and fortunate you found a hub that was intended to have an external supply 🙂 could this really be considered modification though, considering the manufacturers already had the board made that way? 😛 awesome job! I _think_ that if you don’t cut the VCC from the USB input, you can use the hub with a USB OTG supporting Smartphone and power the phone as well as use the hub with it. Are these cheap hubs definitely USB 2.0? I read a post somewhere saying that even though USB 2 was written on the case, the transfer speeds were really poor and more like USB 1.1. Drive is self powered and my Galaxy tab 2 cannot supply enough power..
Cut a usb extension cable (male – female) and srip off the data +/- , 5v & grnd cable.. The other male cable was for data transfer so connected the other two wires of it to the female cable. Hard drive was connected to female cable.. Connecting it directly with the same source lights it up..
Tell me what should I do ? Instead of the phone you’ll have your android tablet.Just make sure you cut the red wire (VCC) that goes to the tablet so that no current is pushed into it or pulled from it. I suggest you to make the cable in two steps: (1) make a simple cable for hard drive + power supply, connect both and make sure the hard drive lights up; (2) add the third connector that goes to the phone. by the way, be careful if you’re using cheap chinese cables. Sometimes the colors of the inside wires are not correct. Hope to have helped. If you have any other questions, feel free to ask them. Hello, I did this with mine, but now whenever I plug it in it gives me the “USB Device Not Recognized” message. Tried different 5v supplies with different amps, namely 350mA and 2000mA. I’ve also used a volt meter to verify its constantly at 5v. Makes no difference, Any suggestions? Actually gives me “USB Device Not Recognized” when I plug a device in, doesn’t recognize the hub itself. Hi! Maybe you should try to check if all the wires VCC, D+, D- and GND are correctly soldered. In some hubs the cables are very thin and sometimes they get broken or desoldered during the hack. By the way, did you test your hub before modifying it? Nice hack. Going to try this soon! I was wondering: Since the pcb of the hub was designed for external power and host-power at the same time. Don’t you thing that cutting the vcc cable is unneccesary? They probably have taken care of the “two batteling supplies” problem. Maybe you can even discover the pads where a schottky should be soldered in? Very nice write up. I also appreciate the excellent comments to this post! I noticed with my RasPi that my camera is only working through a powered usb hub.. Otherwise it isn’t detected. I just ordered 3 different cheapo USB hubs and will be taking a crack at this same problem. The hub that I have is needed for some very important Rock Band action…. So armed with all of the feedback and knowledge shared I am going to take a crack at this. On Step 3 where you indicate cutting the VCC lead that goes to the computer, couldn’t you just connect that to Pin 3 on the DC jack? I would think this would allow you to use either power sources interchangeably vs. now making an external AC adapter a requirement. You could, if the PCB traces would let you 🙂 If you see this picture: https://lh3.googleusercontent.com/-q9imzLxBadM/Uh6HY7W5JwI/AAAAAAAAEaI/VpA52KoYptQ/s912/hub_usb_power_connector_4.jpg you will see that pins 1 and 3 are on the same PCB trace. No matter if you have a male barrel connector plugged in or not, they will always be shorted. 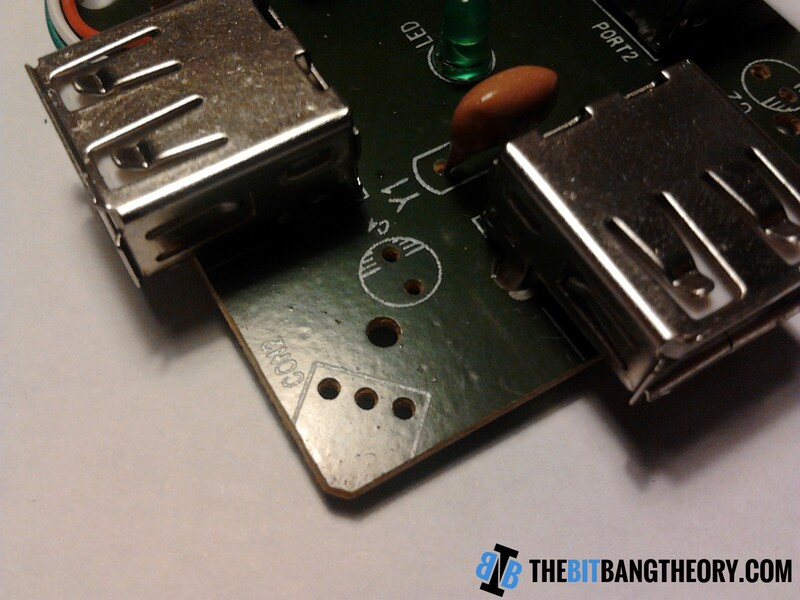 To use the barrel connector as you referred, the two pins that are shorted when there is no connector should be soldered on different PCB traces and the USB GND would have to be connected to the pin that is either shorted or disconnected to the external barrel pin. you do not have desoldered the black wire on the board, only the red one? can i attach a 12 V-1.5 A dc power supply as the power source on the hub ? Hi! You can’t use such power supply with the USB hub. You’ll probably end up damaging all the devices that you plug into the hub, as the hub itself. Al USB devices run with a voltage of 5V. You should not attempt to use any power supply with lower or higher voltage than 5V. The only way to use such power supply is if you use a voltage regulator to drop the voltage from 12V to 5V and then you can use it as a power source for the USB hub. Can i just use a Mobile Phone charger to power the board? As far as i know, mobile phone charger (the one i have) supply 5V 550mA. Hi! Yes, You can do that without having any problems. 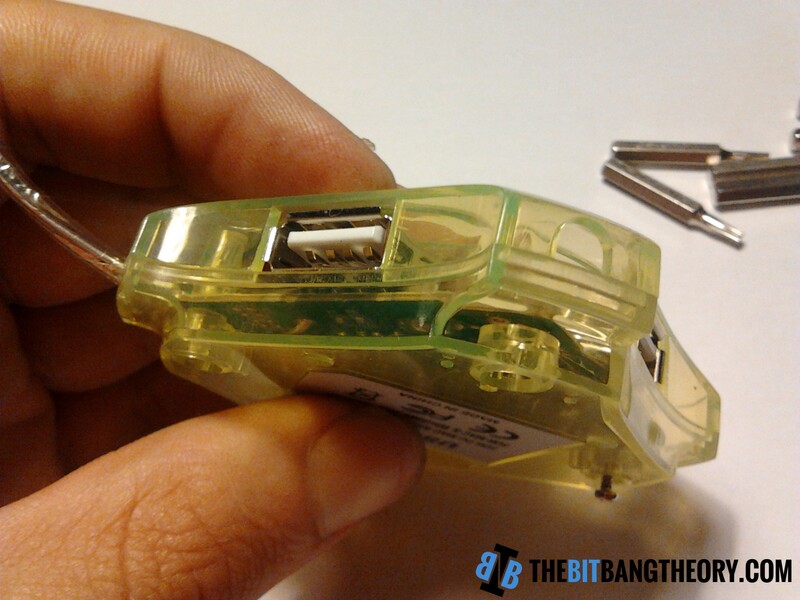 Just make sure that your charger can provide enough current for all the devices that you plug into your USB hub. I’ve open up my usb hub and the “connector slot” is different and I can’t find any connector to fit in. Any solution? Hi! The inner pad should be VCC and both outside pads are GND. You can just solder some wires to them and put an external cable connector. Would I keep the VCC wire in the cable going out of the hub if I’m connecting that to an iPad and want to be able to charge the iPad while the hub is connected with the 5V power supply? Hi Brandon! If I understood your question, yes, you can leave that wire to charge your device. The major problem occurs when the device provides energy via that port and then you have two competing power supplies. Hi Mario; nice post. This just in: a 2TB external HDD by Verbatim (model#47672), obviously with an AC adapter rated at 12V – 1.5A power output failed sometime back. Recently, I finally managed to pry the enclosure open: a 3,5″ Seagate Barracuda Green drive with the following spec: +5V 0.50A, +12V 0.33A inside. The SATA connector broke off the board. The cheap hub I got has an external power connector (came without cable and no user-manual, if any). As is, VCC is connected to the board (obviously). The enquiry is as follows:  does the use of an external source require VCC disconnected? is it advisable to use the AC adapter that the drive came with, even though its rated at 12V-1.5A, on this cheap hub; or would a mobile phone charger rated at 5V-0.50A be sufficient to power this drive? and finally  could you shed some clarity on why the 5V and 12V annotations on drives and external enclosures (I’ve got another enclosure (IDE) with an external supply of 5V-2A, 12V-2A, notice that the current rating is the same)…Looking forward to hearing from you. Can I use one of the USB ports available on the hub to power that hub? 1- I’ll get a male to male USB cable. 2- I’ll plug one end of the USB cable into a USB charger (2.0A, 5V). 3- I’ll plug the other end of the USB cable into one of the ports available on the USB hub. 4- I’ll cut the hub’s VCC red wire as you mentioned above. 2- Will the hub then provide the correct power to the rest of the ports (500mA,5V for each of the 3 empty ports)? “assuming it is a 4 ports hub of course”, or doing so will need extra steps and procedures? 3- Assuming all ports working at full capacity, if each port requires a 500mA, 5V, so for a 4 port USB hub, wouldn’t that require at least a 2.0A, 5V adapter? or will any adapter work? (say a 500mA, 5V), how this works actually? 4-Will it be safe to plug my stuff then? USB HDD, external drives (DVD, HDD ..etc), flash drives, card readers ..etc, I mean will there be any extra power delivered to them somehow because of the charger or the cable specifications? do I need to be cautious of same? 6- Will the hub provide only 500mA, 5V for the ports used for charging? or will it provide more for the charging processes? 7- If it will provide more for the charging processes, will that need a more powerful charger? or will my 2.0A, 5V work just fine? Sorry for the too many questions, and this was very useful indeed! thank you! It will work if my port are not giving power but may be they are fine and need some external power supply. I’m going to try this. Thanks for your solution. Mario: You seam to be the GoTo guy on this type of issue. My question is a bit different than a basic USB power supply but, not far off. If this is the wrong place to post the question please delete and re-direct me. Thank you for responding to my question. The link you mentioned was not in your response, would you try again to attach it. I am looking for more info with the internal circuitry, but not having any luck. Looking at the way the AMS 1117 is installed it sure does look like the LM78xx. One advantage I have is the battery is quite large in AH so a little loss in heat will not drain from its usefulness. Mario, since my support to the Website will also support you – I AM IN FAVOR OF THAT! Make sure you send me the link.